You don`t have to spend a lot of your money in order for your bathroom to look expensive. Here are some really inexpensive ways to add some opulence to a bathroom. A dimmer switch added in your bathroom can do wonders to the overall mood. It will seem that your bathroom is more sophisticated. Hanging some artwork in your bathroom will make it look truly special. You should choose original artworks, but you can also go with prints. They will provide some visual interest to your bathroom. You can transfer liquid soap and also creams to uniform matching containers. This way you will contribute in creating a more appealing look to your bathroom. Some fresh flowers added in your bathroom are a great way to add a delightful scent. You won`t need to add any air freshener in the bathroom. An old ladder can be easily used to create a storage solution for your towels. A hanging light fixture will make your bathroom appear to be truly special. It will add a touch of class in your bathroom. Another really great idea is to replace your bathmat with a rug. The rug will feel nice under your feet and it will also add a splash of color into your bathroom. A seating is often forgotten to be added in the bathroom. An elegant seating will provide another place to sit down in the bathroom besides the toilet lid. An eye catching wallpaper will transform your bathroom because it will be a fast and also inexpensive way to do so. It will transform it from drab to fab in no time. A wooden bathtub tray will provide yourself with the needed lux. You will also have a place to put your book or even your device. A glass of wine can also be added on this tub tray in order to make your experience truly great. 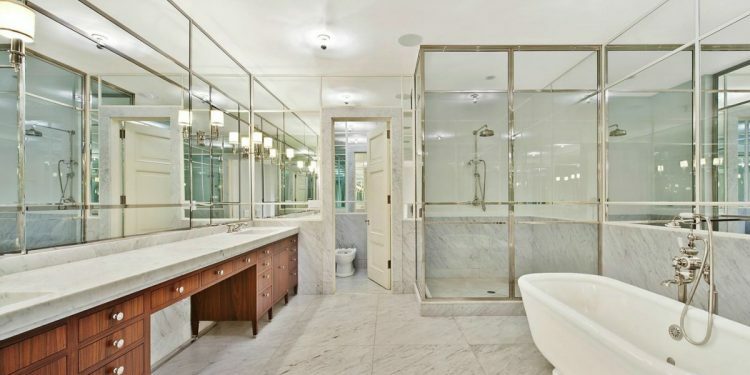 The addition of polished brass can make an ordinary bathroom seem opulent. A brass towel ring will have the similar effect. This one can be easily created by yourself. You will be able to create a really interesting toilet paper holder that will make your bathroom seem more opulent. A classy container for mouthwash is a perfect addition to your bathroom in order for it to look more expensive. You can replace your old bathroom mirror with something more interesting. A mirror hung with a rope can provide a touch of elegance. You will be able to find everything you need much faster if you will add an open shelving. You will also create a point of visual interest if you do so. The shelves will look really nice, but you should take care so they don`t become cluttered.